Sprouts is a concerned retailer and the reflection of this concern about healthy and high-quality organic foods can be seen on their weekly ads, too. Browse the Sprouts Weekly Ad for Easter discounts on fresh produce, grocery, breakfast foods, canned goods, and many more weekly items. You can really save on healthy foods. For example, buy strawberries or blueberries at 2/$3! Green beans are $.88/lb. Moreover, you have a special breakfast and Annie's products sale on pg 2-3. Discover the organic fresh products like pineapples, eggplant, snacking tomatoes, Valencia oranges etc. 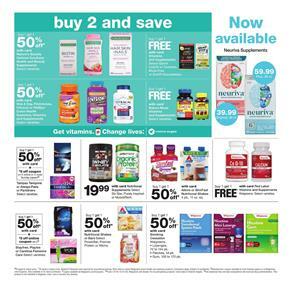 Sprouts Ad offers grocery specials on pg 5. BOGO Free the Spice Hunter spices and pay only $5 for 2 of pacific organic broth. Buy Sprouts cheese puffs or veggie chips at 3/$5! All-Natural 100% Grass-Fed Ground Beef $3.99/lb. 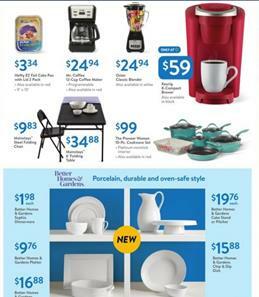 Buy grocery products and snacks with the prices of Hy-vee Weekly Ad Easter Sale Apr 17. If you are planning a party to celebrate Easter, check out the platters that can make great party foods. They have new products at lower prices. 12" vegetable tray with dip is gonna cost only $20! Find desserts on the same part of the ad. Chocolate covered strawberries will be only $9.99! Brunch is one of the activities that I like if I am gonna gather people or the family. 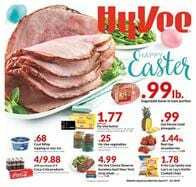 Hy-Vee has Sunday brunch buffet on Easter Sunday from 9 A.M. to 2 P.M.
Hyvee Ad Easter bunnies, candies, chocolate, eggs, confectionery, and more festive products are on pg 4-5. Additional savings like $.15 discount per gallon of fuel can be yours for purchases like basin products. Buy desserts and baking products at Hy-Vee. Kraft Jet-puffed marshmallows or creme, graham cracker pie crust, and Baker's coconut or cooking chocolate are three products to make chocolate marshmallow pie. You have also accessories or kitchen gadgets for baking something or making sweets. 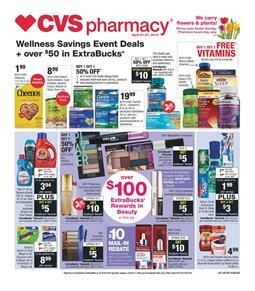 Save a lot with new ExtraBucks rewards and coupon from the CVS Weekly Ad Apr 21 - 27. Discover the BOGO Free vitamins on the first page. Beauty products are on sale. Over $100 ExtraBucks rewards are in the beauty section. Physicians Formula, L'Oreal cosmetics, and many more brands are possible brands to spot within the ExtraBucks rewarded range. Snacks and beverage are the major subjects of the first pages content of the latest ad. Diet Coke, Kellogg's cereals, Just the Basics purified water is gonna cost only $2.49 at CVS. Also, find candies and chocolate products like M&M's. Airheads, Mentos gum, or chewy mint will be a BOGO Free deal at CVS next week. Russell Stover sugar-free is a BOGO 50% off sale. Review your breakfast foods like cereals. You can buy a great range of foods at CVS stores. Coffee-mate or Post Cereal, eggs, and breakfast bars are on sale. Buy one dozen egg for only $1.69! See the list below that contains great discounts and ExtraBucks Rewards.